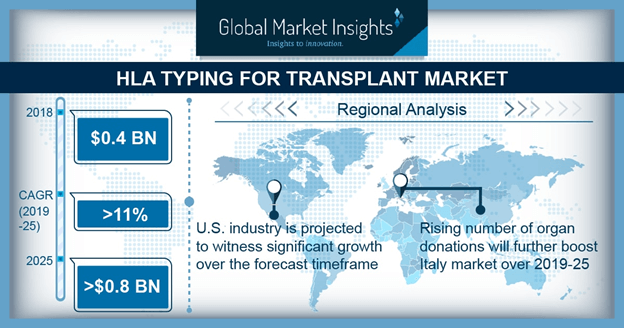 HLA Typing for Transplant Market size is set to exceed USD 0.8 billion by 2025; according to a new research study published by Global Market Insights, Inc.
Increasing number of individuals afflicted with terminal and irreversible organ failure is resulting in an increasing demand for organ transplant procedures which will drive industry growth during the forecast years. Elderly population has a higher vulnerability towards various chronic ailments leading to organ failures. The increasing elderly population pool will propel industry growth. Introduction of advanced technologies which provide enhanced allele resolution will further propel demand. However, higher costs of molecular tests used for HLA typing procedures impedes adoption. The presence of considerable gap between number of organs being donated and those required for transplant procedures limits industry growth. Molecular assays business segment will grow at a robust rate during the forecast years owing to increasing use of sequence based methods such as sanger sequencing and next generation sequencing for typing procedures. Reagents and consumables industry segment held significant industry share in 2018 and is poised to grow at a rapid pace during the forecast timeframe as they are required in large quantities for HLA typing. Application of HLA typing in research is slated to increase at a lucrative pace owing to the spur in research and development activities being carried out to develop methods which are more advanced and accurate as compared to existing ones. Hospital end user segment will grow at a rapid pace owing to the increasing number of organ transplant procedures being performed in these settings. Growing number of hospitals in several countries because of the healthcare infrastructure expansion plans will further augment segment growth. Mexico HLA typing for transplant market is poised to grow at a lucrative rate over the forecast years owing to the increasing number of organ donations. Growing public awareness regarding importance of organ donation will further fuel growth. Campaigns such as ‘Héroes por la Vida’ (Heroes for Life) are being organized of sensitizing the masses and urging them to opt for organ donation. India HLA typing for transplant market will grow at a robust rate owing to increasing awareness pertaining to diseases such as leukemia and thalassemia which require bone marrow transplants. Not for profit organizations such as MOHAN foundation are promoting organ donation through awareness campaigns, newsletters, patient support groups and network for organ sharing. Prominent industry players include CareDx, Pacific Biosciences of California, Illumina, Thermo Fischer Scientific, GenDx and Immucor. The industry players employ various strategies such as distributor agreements, product portfolio expansion, acquisitions, collaborations and partnerships for increasing their industry shareholding. For instance, in July 2017, Thermo Fischer Scientific acquired Linkage Biosciences. Linkage Biosciences is now a part of Thermo Fischer’s transplant diagnostics business along with One Lambda. The acquisition has broadened the company’s product portfolio in turn strengthening its presence in the HLA typing for transplant industry.